Hello stampers!!! Welcome!! I am back into crafting action!!! After a few days "off" because of some personal issues that have been going on i have been unable to get into my craft room. Over this past weekend i went on my annual crafting weekend with my wonderful mama in Cheasning, MI. We had a great time and it was a great escape from reality, which i for sure needed. Except I was missing my baby girl and hubby like crazy... but i was able to Skype them oh.... about every 20 minutes, lol. It doesn't matter how old my baby gets or how long i have been married to my hubby, leaving them is always SO hard on me!! 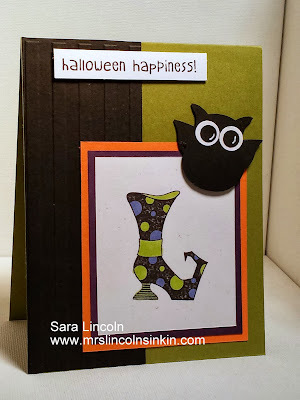 Anywhoo, enough with all of that:) Today's share is a Halloween card that i made using the Bootiful Occasions stamp set. My card measures average size of 4 1/4" x 11" and then scored at 5 1/2". I added a piece of Basic Black card stock measuring 2" x 5 1/2". I ran it though my Big Shot using my Stripes embossing folder to give it some charter. Then, i backed my image with 2 different colors. For the back piece (larger color) i chose Pumpkin Pie measuring 3" x 3 1/4", then Elegant Eggplant measuring 2 3/4" X 3". My Whisper White is measured at 2 1/2" x 2 3/4". To add a bit more something i chose to make another "bat" using my Owl Builder punch. I love making these cute little guys.